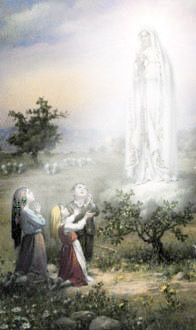 On May 13, 1917, in a field called Cova da Iria near the Portuguese village of Fatima, "a beautiful lady from Heaven", shining like the sun and standing on a cloud over a beech tree, appeared to three children: Lucia Dos Santos (age 10) and her two cousins, Francisco (9) and Jacinta Marti (7). Lucia saw and heard the Madonna and spoke with her. Jacinta also saw and heard her, but did not speak, and Francisco only saw the Virgin. and delivered a prophecy that would change the world. The radiant being spoke with the children for several minutes, and asked them to meet her again at the same place on the 13th of each month until October. Then, she promised, she would identify herself. The Madonna reappeared six times in all, and the reports of the events drew increasing crowds of spectators. About 50 persons attended on June 13, and nearly 70,000 were present on October 13. Many witnesses saw a bright cloud over the beech tree, but only the three children could see and hear the woman. They were given prophecies concerning World Wars I and II as well as the world wide spread of communism. But their third prophecy was not officially released until recently...and there are those who maintain that the real revelations were not disclosed by the church. At the behest of a group of political activists and doubters who wished to "put an end to the nonsense," the civil prefect of Outrem seized, interrogated and threatened the children for two days in the hope of forcing a confession of fraud from them. Though the children had been prevented from meeting the Madonna on August 13, she appeared to them on August 19 at Valinhos, near the site of her first appearance. The Madonna then told them that she would appear a final time on October 13, and then produce a miracle. It whirled upon itself with mad rapidity, then advanced, blood red, towards the Earth, threatening to crush us with its weight." Terrified spectators fell to their knees in prayer. The sun returned to normal, then twice again repeated the prodigy. In addition, the rain-soaked clothes of the audience dried out during the brief time of the solar phenomenon. On May 13, 1917 a luminous Apparition of the Virgin Mary appeared to three peasant children and delivered a prophecy that would change the world. Investigations into the Fatima event have proved that the miracle of October 13, 1917 was seen over an area of 32 miles by 20. An area of over 600 square miles. 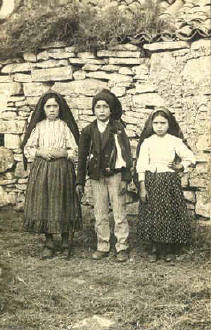 The three children - Lucia, Jacinta and Francisco took their flock of sheep to a natural hollow in the ground known as the Cova da Iria to graze, just outside the town of Fatima in Portugal. While the sheep were grazing the children began to play. Suddenly there was a flash of lightening. The children looked up, bewildered into the sky. The day was quiet pleasant and there was no sign of a storm. They started to gather the sheep thinking a storm was brewing in the distance when there was a second flash that caused total concern. A few meters away stood a Lady of dazzling light. Their eyes were unable to comprehend the lady's brilliance and beauty . The children smelled rose. "Where are you from?" Lucy managed to ask. "What do you want of us?" asked Lucia. "I came to ask you to come here on the thirteenth day for six months at the same time, and then I will return here a seventh time." After several other messages the lady asked finally for them to recite the Rosary daily before she rose in a cloud of light and glided away into the eastern sky. Lucia warned her cousins to say nothing of what they had seen out of fear of disbelief, but Jacinta was too excited. Predictably Jacinta told her parents about the Apparition and there was a general reaction of disbelief. Lucia`s mother was convinced that her child was lying and punished her continually when she refused to deny her story. Other children laughed at them and even spat at them. But the visions of Mary -- and her series of prophecies remained apparent to the three children. At first, Lucia, Francisco and Jacinta had great difficulty trying to share what they had seen, because the government of Portugal was heavily opposed to religion at that time. Francisco and Jacinta died in an influenza pandemic within three years of the 1917 "dance of the sun." Lucia went on to become a nun. 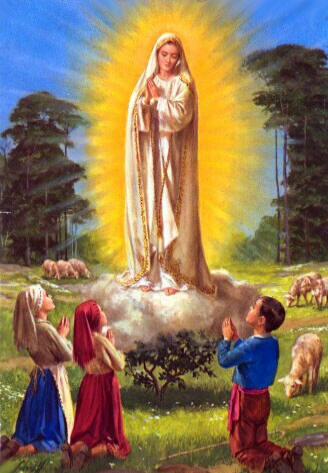 She told the church the details of Fatima prophecies, the first parts of which have common public knowledge for many years. A short time later another vision appeared. "I looked at the sun and saw it spinning like a disc, rolling on itself. I saw people changing colour. They were stained with the colours of the rainbow. The sun seemed to fall down from the sky . . . The people said that the world was going to end . . . They were afraid and screaming." - Antonio de Oliveiro, Farmer. "Suddenly the rain stopped and a great splendour appeared and the children cried: 'Look at the sun!' I saw the sun coming down, feeling that it was falling to the ground. At that moment, I collapsed." - Maria Candida da Silva. "I looked and saw that the people were in various colours - yellow, white, blue. At the same time, I beheld the sun spinning at great speed and very near me. I at once thought: I am going to die." "Before the astonished eyes of the crowd, whose aspect was biblical as they stood bareheaded, pale with fright, eagerly searching the sky, the sun trembled, made sudden incredible movements outside all cosmic laws - the sun 'danced' according to the typical expression of the people. Standing at the step of the Torres Novas bus was an old man, whose appearance in face and figure reminded one of Paul Deroulede. With his face turned towards the sun he recited the Creed in a loud voice . . . Afterwards, I saw him going up to those around him who still had their hats on, and vehemently imploring them to uncover their heads before such an extraordinary demonstration of the existence of God. Identical scenes were repeated elsewhere, and in one place, a woman cried out in a gasp of surprise: 'How dreadful that there are some men who do not even bare their heads before such a stupendous miracle!' People then began to ask each other what they had seen. The great majority admitted to having seen the trembling and the dancing of the sun. Others affirmed that they saw the face of the Blessed Virgin, while others swore that the sun whirled on itself to the earth as if to burn it with its rays. Some said they saw it change colours successively." "It was almost three o'clock in the afternoon. The sky was swept clear of clouds and the sun followed its course in its usual splendour, so that no one ventured to gaze at it directly. What about the little shepherds? Lucia, who had spoken to Our Lady, was announcing with expressive gestures, as she was carried along shoulder-high by a man and passed from group to group, that the war would end and that the soldiers would return . . . But news like that, however, did nothing to increase the jubilation of those who heard it. The heavenly sign was sufficient for them: it was everything. "Intense curiosity prevailed to see the two little girls in their wreaths of roses, and to kiss the hands of these 'little saints', one of whom, Jacinta, seemed nearer to fainting than dancing. They had so longed to see the sign from Heaven: they had seen and were satisfied and radiated burning faith . . . The crowd dispersed rapidly, without any difficulty, without any sign of disorder, without any need for policemen to regulate them. Those who were the first to arrive were also the first to depart, running out on the roadway, traveling on foot with their footwear in a bundle on their heads or strung from their staffs. They went, with hearts overflowing with joy, to bring the good news to their hamlets that had not been wholly depopulated for the time being. "And what of the priests? Some turned up at the place, mingling more among the curious spectators rather than among the pilgrims avid for heavenly signs and favours. Perhaps neither one nor the other succeeded in concealing their happiness, which so often transpired in triumphant guise . . . It only remains for those competent to do justice to the bewildering dance of the sun which, on this day in Fatima, caused Hosannas to resound from the hearts of all the faithful present, and naturally made a great impression, as people worthy of belief assured me, on the freethinkers and others without any religious conviction who had come to this now famous spot located on the poor pastureland high up on the serra. "The sun started to roll from one place to another and changed to blue, yellow - all colours. Then we see the sun coming towards the children. Everyone was crying out. Some started to confess their sins because there was no priest around there . . . My mother grabbed me to her and started to cry, saying 'It is the end of the world!' And then we see the sun come right into the trees . . ."
-Dominic Reis, in an American TV interview, 1960. This sounds much like a UFO / ET experience - holographic projections for many to see. It included spiritual messages to be read at the appropriate times. Two of the messages have come to pass. The third is known by certain members of the clergy. Lucia said the first secret shown to them by Mary began with a terrifying vision of hell. Mary then indicated that the war would soon end, as World War I did in the following year. But Mary foresaw that a "night illuminated by an unknown light" would precede a "worse war" in which "The good will be martyred" and "The Holy Father will have much to suffer." On January 25, 1938, a remarkable display of aurora borealis was visible across Europe, the year before World War II began. The second secret involved the future of Russia. Lucia says Mary revealed that Russia would "spread her errors throughout the world, promoting wars," and that "Various nations will be annihilated." Many believe this is a direct prophecy of the spread of communism. "I shall come to ask for the consecration of Russia to My Immaculate Heart," continues the account of Mary's revelation. "If people attend to My requests, Russia will be converted and the world will have peace." 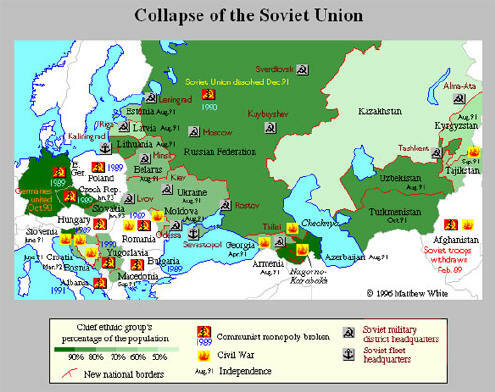 Some interpret Pope John Paul II's 1984 consecration of Russia as fulfilling the prophecy, and paving the way for the subsequent collapse of the Soviet Union as the "conversion" of Russia. The Secret of Our Lady of the Rosary is a three-part prophecy that she ordered to be kept secret for 25 years or until the death of Lucia, whichever came first. Francisco and Jacinta died in the influenza pandemic that ravaged Europe in 1918 and 1919. Lucia became a Dorothe Sister, and in 1948 she became a Barefoot Carmelite in a closed convent at Coimbra. Lucia learned to write, and recorded the text of the secret prophecy. This was kept in the Bishopric of Leiria until 1943, when Pope Pius XII revealed the first two parts through the agency of Cardinal Schuster. The final, secret part of the prophecy was opened by Pope John XXIII and several cardinals in 1960, according to the Madonna's directions, but it was not revealed to the public. The first section is a vision of Hell. The second part predicts World War II. "If you do what I tell you, many souls will be saved and we shall have peace. The war is coming to an end; but it does not cease to offend the Lord, and another, more terrible one will break out. When you see a night lit up by an unknown light, you will know that it the great sign that God gives you of the next punishment of the sins of the world with war, famine, and persecution against the Church and against the Holy Father. "In order to prevent this, I have some to intercede for the consecration of Russia to my Immaculate Heart and the communion of the first Sabbaths. "But in the end my Immaculate Heart will triumph, the Holy Father will consecrate Russia for me, which will be converted and the world will be granted a period of peace..."
The "great sign", "a night lit up by an unknown light," occurred on January 25, 1938. It has been explained as an unusual aurora borealis. World War II began soon afterward. "Have no fear, little one. I am the Mother of God who speaks to you and asks you to publish the message I am going to give you to the whole world. You will find strong resistance while you do so. Listen well and pay attention to what I tell you. "Men must be set on the right road once more. With suppliant humility, men must seek forgiveness for sins committed already and for sins which will be committed. You wish me to give you a sign, so that everyone will accept My Words, which I am saying through you, to the human race. I have seen the Prodigy of the Sun and all believers, unbelievers, peasants, countrymen, wise men, journalists, laics and priests, all have seen it. And now I proclaim in my name: A great punishment shall fall on the entire human race, not today and not tomorrow, but in the second half of the 20th century! I have already revealed to the children Melanie and Maximime at La Salette, and today I repeat it to you for the human race has sinned and has trampled down the Gift which I have made. In no part of the world is life in order, Satan rules in the highest position, laying down how things should be done. He will effectually succeed in bringing his influence right up to the top of the Church; succeed in seducing the spirits of the great scientists who invent the arms. And if humanity opposes me I shall be obliged to free the arm of My Son. Now I see that God will punish man with a severity that has not been used since the Flood. "The time of times will come and everything will come to an end if humanity is not converted, and if things remain as they are now or get worse, the great and powerful men will perish just as will the small and weak. "For the Church, too, the time of its greatest trial will come. Cardinals will oppose cardinals and bishops against bishops. Satan will march in their midst and there will be great changes at Rome. What is rotten will fall, never to rise again. The Church will be darkened and the world will shake with terror. The time will come when no king, emperor, cardinal or bishop will await Him who will, however, come, but in order to punish according to the designs of my Father. "A great war will break out in the second half of the 20th century [not�]. Fire and smoke will fall from heaven, and waters of the oceans will become vapors, the scum will arise in a confused manner, and everything will sink down. Millions and millions of men will perish while this is going on and those who survive will envy the dead. The unexpected will follow in every part of the world, anxiety, pain and misery in every country. Have I seen it? The time is getting ever nearer and the abyss is getting wider without hope. The good will perish with the bad, the great with the small, the Heads of the Church with their faithful, and the rulers with their people. There will be death everywhere as a result of the mistakes of the unfeeling and the partisans of Satan, but when those who survive all these happenings are still alive, they will proclaim God once again and His Glory, and will serve Him as in the time when the world was not so perverted. "Go, my little one and proclaim it. For that purpose I shall always be at your side to help you." "A great plague will befall mankind in the year 2000. Nowhere in the world will there be order, and Satan will rule the highest places, determining the way of things. Satan will even succeed in asserting himself at the top of the Church. "He will succeed in seducing the spirits of the great scientists who invent arms, with which it will be possible to destroy a large part of mankind in a few minutes. Satan will have in his power the leaders who command the people and who will incite them to produce enormous quantities of arms. "God will punish man more thoroughly than with the Flood. There will come the time of all times and the end of all ends. The great and the powerful will perish together with the small and weak. "Even for the Church, it will be the time of its greatest trial. Cardinals will oppose cardinals, bishops will oppose bishops. Satan will walk in their midst and in Rome there will be great changes. The Church will be darkened and the world will be shaking with terror. "A huge war will erupt: fire and smoke will fall from the sky. The waters of the ocean will become mist, and the foam will rise to tremendous heights and everyone will drown. "Millions and millions of men will die from hour to hour. Whoever remains alive will envy the dead. Everywhere one turns one's glance there will be anguish and misery, ruins in every country. "The time draws nearer, the abyss widens without hope. The good will perish with the bad, the great with the small, the princes of the church with the faithful, the rulers with their people. "There will be death everywhere because of the errors committed by the crazed and the followers of Satan, who will then and only then rule the world. "At the last, those who survive will at every chance newly proclaim God and His glory and they will serve Him as when the world was not so perverted." "There is a secret of Heaven and one of earth, and the latter is terrifying. It will seem as though it were already the end of the world. And in this cataclysm everything will be separated from the sky, which will turn white as snow." "Due to the seriousness of the contents of the Fatima secret, my predecessors in the Throne of Peter have preferred to postpone the publication. Furthermore, it may be enough to the christian people to know that, if there is a message saying that the oceans will flood whole parts of the globe, and millions of people will die, from a minute to another, it is not really the case to will the publication of this secret message." Pope John Paul II was nearly assassinated on May 13, 1981 (the anniversary of Mary�s first apparitional appearance at Fatima). The gun was aimed at the Pope�s head, but Agca had to aim for his abdomen instead when the pontiff turned to a young girl who was wearing a picture of Our Lady of Fatima. While he was in the hospital, Pope John Paul reviewed the Church�s documentation of Fatima, and he read the secret Third Secret of Fatima. In 1984 the Pope consecrated Russia to the Immaculate Heart of Mary. Communism collapsed soon afterward. "As is well known, Pope John Paul II immediately thought of consecrating the world to the Immaculate Heart of Mary and he himself composed a prayer for what he called an 'Act of Entrustment' which was to be celebrated in the Basilica of St. Mary Major on June 7, 1981." "That text contains a prophetic vision similar to those found in Sacred Scripture, which do not describe with photographic clarity the details of future events, but rather synthesize and condense against a unified background events spread out over time in a succession and a duration which are not specified. As a result, the text must be interpreted in a symbolic key. "The vision of Fatima concerns above all the war waged by atheist systems against the Church and Christians, and it describes the immense suffering endured by the witnesses to the faith in the last century of the second millennium. It is an interminable Way of the Cross led by the Popes of the twentieth century. "According to the interpretation of the 'little shepherds,' which was also recently confirmed by Sister Lucia, the 'bishop clothed in white' who prays for all the faithful is the Pope. As he makes his way with great effort towards the Cross amid the corpses of those who were martyred (bishops, priests, men and women religious and many lay persons), he too falls to the ground, apparently dead, under a burst of gunfire. "After the assassination attempt of May 13 1981, it appeared evident to His Holiness that it was 'a motherly hand which guided the bullet's path,' enabling the 'dying Pope' to halt 'at the threshold of death.' On the occasion of a visit to Rome by the then bishop of Leiria-Fatima, the Pope decided to give him the bullet which had remained in the jeep after the assassination attempt, so that it might be kept in the Shrine. At the behest of the bishop, the bullet was later set in the crown of the statue of Our Lady of Fatima. "After the two parts which I have already explained, at the left of Our Lady and a little above, we saw an Angel with a flaming sword in his left hand; flashing, it gave out flames that looked as though they would set the world on fire; but they died out in contact with the splendor that Our Lady radiated towards him from her right hand: pointing to the earth with his right hand, the Angel cried out in a loud voice: 'Penance, Penance, Penance!' And we saw in an immense light that is God: 'something similar to how people appear in a mirror when they pass in front of it' a Bishop dressed in White 'we had the impression that it was the Holy Father'. Other Bishops, Priests, men and women Religious going up a steep mountain, at the top of which there was a big Cross of rough-hewn trunks as of a cork-tree with the bark; before reaching there the Holy Father passed through a big city half in ruins and half trembling with halting step, afflicted with pain and sorrow, he prayed for the souls of the corpses he met on his way; having reached the top of the mountain, on his knees at the foot of the big Cross he was killed by a group of soldiers who fired bullets and arrows at him, and in the same way there died one after another the other Bishops, Priests, men and women Religious, and various lay people of different ranks and positions. Beneath the two arms of the Cross there were two Angels each with a crystal aspersorium in his hand, in which they gathered up the blood of the Martyrs and with it sprinkled the souls that were making their way to God." The Secret of Fatima - The original text and translation! Vatican ends mystery of the third prophecy of Fatima. Secret revealed as Pope John Paul II beatifies children who saw vision of Mary. 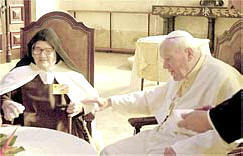 Pope John Paul II spoke yesterday with Lucia de Santos, 93, a Carmelite nun, who believers say was the main recipient of prophecies from the Virgin Mary that included the spread, and then the collapse, of Communism. The Vatican today disclosed the so-called third secret of F�tima, which for decades has kept this shrine of the Virgin Mary at the center of conspiracy theories and doomsday cults. The Vatican described the secret as a vision of the 1981 assassination attempt on Pope John Paul II. While Pope John Paul II was circling St. Peter's Square before his Wednesday general audience at the Vatican in May 1981, a Turkish gunman named Mehmet Ali Agca opened fire on the pontiff. The pope spent more than two months recovering in a Rome hospital. 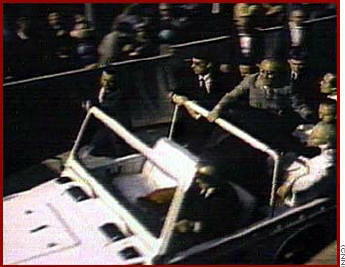 The gunman had also stalked John Paul during a visit to Turkey in 1979. In December 1983, the pope offered forgiveness to Agca during an arranged meeting in prison. During the trial, Agca had claimed that East European communist agents had helped him set up the attack on the pope, but he later recanted. Cardinal Angelo Sodano, the Vatican secretary of state, explained that the one concealed part of the prophecies said to have been revealed to three Portuguese shepherd children by an apparition of the Virgin in 1917 was a vision of an attempt to kill a pope. The "bishop clothed in white," who is the pope, "makes his way with great effort toward the cross amid the corpses of those who were martyred," Cardinal Sodano said as he described what he called an interpretation of the vision to 600,000 pilgrims gathered at the sanctuary where John Paul II had just beatified two of the shepherd children, Francisco and Jacinta Marto, and thanked the Virgin for saving his life on May 13, 1981. "He too falls to the ground, apparently dead, under a burst of gunfire," the cardinal said. Mehmet Ali Agca, a Turkish gunman, shot the pope as John Paul drove through a crowd in St. Peter's Square in 1981 on the anniversary of the 1917 apparition. Among the explanations the gunman gave prosecutors at a trial in 1985 was that his attempt was "connected to the third secret of the Madonna of Fatima." The cardinal's announcement was an effort by the Vatican to put an end to the kind of fevered speculation that has at times overshadowed the shrine's spiritual importance to hundreds of millions of Catholics. Versions of the secret, broadcast on hundreds of Web sites (usually under headlines like, "Third Secret Revealed!") range from worldwide nuclear annihilation to deep rifts in the Roman Catholic Church that lead to rival papacies. "On the solemn occasion of his visit to Fatima, His Holiness has directed me to make an announcement to you. 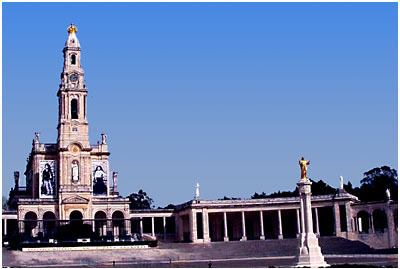 As you know, the purpose of his visit to Fatima has been to beatify the two "little shepherds." Nevertheless, he also wishes his pilgrimage to be a renewed gesture of gratitude to Our Lady for her protection during these years of his papacy. This protection seems also to be linked to the so-called "third part" of the secret of Fatima. "That text contains a prophetic vision similar to those found in the sacred scripture, which do not describe with photographic clarity the details of future events, but rather synthesize and condense against a unified background events spread out over time in a succession and a duration which are not specified. As a result, the text must be interpreted in a symbolic key. "The vision of Fatima concerns above all the war waged by atheist systems against the Church and Christians, and it describes the immense suffering endured by the witnesses to the faith in the last century of the second millennium. It is an interminable Way of the Cross led by the Popes of the 20th century. "According to the interpretation of the "little shepherds," which was also recently confirmed by Sister Lucia, the "Bishop clothed in white" who prays for all the faithful is the Pope. As he makes his way with great effort towards the cross amid the corpses of those who were martyred (bishops, priests, religious men and women and many lay persons), he too falls to the ground, apparently dead, under a burst of gunfire. "After the assassination attempt of 13 May, 1981, it appeared evident to His Holiness that it was a "motherly hand which guided the bullet's path," enabling the "dying Pope" to halt "at the threshold of death." On the occasion of a visit to Rome by the then Bishop of Leiria-Fatima, the Pope decided to give him the bullet which had remained in the jeep after the assassination attempt, so that it might be kept in the shrine. At the behest of the bishop, the bullet was later set in the crown of the statue of Our Lady of Fatima. "The successive events of 1989 led, both in the Soviet Union and in a number of countries of Eastern Europe, to the fall of the Communist regime which promoted atheism. For this too His Holiness offers heartfelt thanks to the Most Holy Virgin. In other parts of the world, however, attacks against the Church and against Christians, together with the burden of suffering which they involve, tragically continue. Even if the events to which the third part of the Secret of Fatima refers now seem part of the past, Our Lady's call to conversion and penance, issued at the beginning of the 20th century, remains timely and urgent today. "In order that the faithful may better receive the message of Our Lady of Fatima, the Pope has charged the Congregation for the Doctrine of Faith with the making public the third part of the secret, after the preparation of an appropriate commentary." Fatima fanatics have held hunger strikes - one even hijacked a plane - to try to force the Vatican to disclose the secret. During John Paul's first visit to the shrine in 1982, on the first anniversary of the assassination attempt, a knife-wielding Spanish priest tried to kill the pope, but was wrestled to the ground by security officers. John Paul has always credited the Virgin of Fatima with saving his life. After he visited the shrine in 1982 to give thanks for his survival, a bullet extracted from his body was placed alongside diamonds in a gold crown worn by a statue of the Virgin. In 1991, on the 10th anniversary of the attack, he returned again to give thanks for his life as well as for the collapse of Communism, which believers say the Virgin of Fatima also predicted in 1917. The cardinal said the secret in its entirety would soon be published by the Vatican "after the preparation of an appropriate commentary." The pope did refer to the prophecies today, speaking of "F�tima, where these times of tribulation were foretold," but he made no mention of the "third secret." Instead, he once again gave thanks "for the goodness of God toward me, when severely struck on that May 13, 1981, I was rescued from death." The pope first learned of the secret a few days after he was elected in 1978, the Vatican said. He did not announce it himself today, said his spokesman, Dr. Joaqu�n Navarro-Valls, because he was "personally involved." Vatican officials did not say why the secret was not revealed sooner after the assassination attempt in 1981. In a new tribute at a prayer service at the shrine on Friday night, the pope donated to the shrine the ring given to him by Cardinal Stefan Wyszynski, the late primate of Poland. Cardinal Wyszynski, whose long fight against Communism in Poland inspired the present pope and millions of their countrymen, told John Paul after his election in 1978 that he would lead the church into the new millennium. Dr. Navarro-Valls dismissed speculation that the gift was a signal that the pope was set to resign as "150 percent wrong." He described the ring as "one of the pope's most precious possessions," given as an offer of thanks. The fact that the pope put the two dead witnesses to the Virgin's apparitions on the path of sainthood today was another sign of his devotion to F�tima. The two, Francisco and Jacinta Marto, are the first children ever beatified by the Roman Catholic Church who were not martyrs. Beatification, which is bestowed only on the dead, is the penultimate step before sainthood. Before the ceremony, the pope, who turns 80 on Thursday, met privately inside the basilica near the children's tombs with the third surviving witness to the apparition, Lucia de Jesus dos Santos, 93, a Carmelite nun, who believers say was the main recipient of prophecies from the Virgin about 20th century debacles. The Vatican said that it had consulted with Sister Lucia before making its announcement today. The Virgin of F�tima was said to have appeared before three shepherd children on May 13, 1917, and on five later occasions. Lucia was 10. Her cousins, Francisco and Jacinta, who were 8 and 7, died in the influenza pandemic a few years later. Believers say two of the F�tima secrets were revealed in writing by Lucia in the 1940's. The third secret was put in a sealed envelope and sent to Rome more than 40 years ago. Interpretations of the secrets vary, but generally believers think that the first foretold the end of World War I and the start of World War II, and that the other predicted the spread, then the collapse of Communism and the conversion of Russia. The latter prophecy, which came with a request that the church consecrate Russia to the Immaculate Heart of Mary, made Fatima an ideological shrine for anti-Communists during the cold war. John Paul II finally consecrated the whole world to the Immaculate Heart of Mary in 1984. Fatima, like the rest of Portugal, also had fascist links during World War II, when Portugal was neutral under the right-wing dictatorship of Ant�nio Salazar but traded with the Nazi regime. This month, the rector of the sancutary, Luciano Guerra, confirmed news reports that in 1976 F�tima received Nazi gold bars bearing the Third Reich insignia looted from Jews during the war, and sold them in 1982 and 1986 to finance construction at the sanctuary. Today, many pilgrims, some wearing baseball hats emblazoned with the names of Jacinta and Francisco, cheered after Cardinal Sodano delivered his message. "It's wonderful that the pope knew the prophecy and survived it," said Lucia Dias, 31, a lawyer from Sintra, who added that she had once believed that the third secret was a prophecy of World War III. She made her own prediction about the pope: "I think now he will die soon." Until today, besides John Paul and Sister Lucia, the only other living person believed to be privy to the secret was Cardinal Joseph Ratzinger, the head of the Vatican's Congregation for the Doctrine of the Faith. In 1996, he told Portugal's main Catholic radio station that there was nothing worrisome in the message, and that it remained secret because the Vatican wanted to avoid "confusing religious prophecy with sensationalism." Whether today's announcement will appease some of the more fanatical devotees of the "third secret" mystery is unclear. Some of those believers, who choose to view the reforms of the Second Vatican Council as heresies predicted by the Virgin of Fatima, may dismiss the Vatican's announcement as a cover-up. Even some who attended Mass today seemed let down. "What they said all happened in the past," Julio Estela, 33, a car salesman from northern Portugal, said after the cardinal spoke. "This isn't a prediction. It's disappointing. I think there's more." The prophecies of Fatima are almost as well known -- and respected -- as those of the famous French seer Nostradamus.In l9l7 three children had repeated visions of the Virgin Mary in Portugal. They were given prophecies concerning World Wars I and II as well as the world wide spread of communnism. But their third prophecy was not officially released until recently...and there are those who maintain that the real revelations were not disclosed by the church.This book not only reveals what the Third Secret Prophecy of Fatima may consist of; but also gives photographic proof that the Virgin Mary has appeared in over two hundred incidents in the last several decades.Arab terrorists? UFOs? 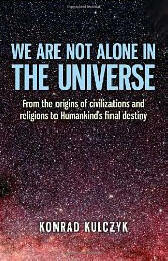 End of the World?The book is very readable and presented in an easy to understand format. It has a good number of pictures and follows a logical order as oppossed to some other books I have TRIED to read on the subject. This is NOT an overly religious approach -- the authors do not seem to have any axe to grind. I recommend this book highly. The Message of Fatima - The original text and translation!